Private F.O. FOSTER is mentioned on the gravestone of his brother Bombardier Harold Foster on Klein Vierstraat British Cemetery, II A8. 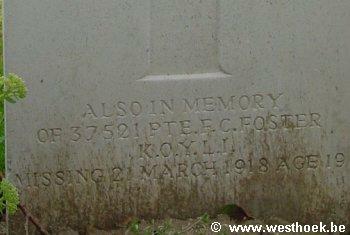 F. Foster died on 21/03/1918, is missing and has his name on the missingmemorial of Pozières.